The V200E-0/10 with its compact 0-10 V transducer makes a simple package for application where a 0-10 VDC signal is desired. This is often found in the HVAC market but certainly adaptable to the industrial process market. The modular design of the product allows for simple conversion at the time of order or in the field. The IP module is extremely resistant to vibration, is not orientation sensitive and has very low air consumption. The V200E-0/10 accepts the 0-10 VDC signal and is available for use on rotary or linear applications. It utilizes a unique spool valve, is a cam characterized, forced balanced instrument that is simple and rugged. 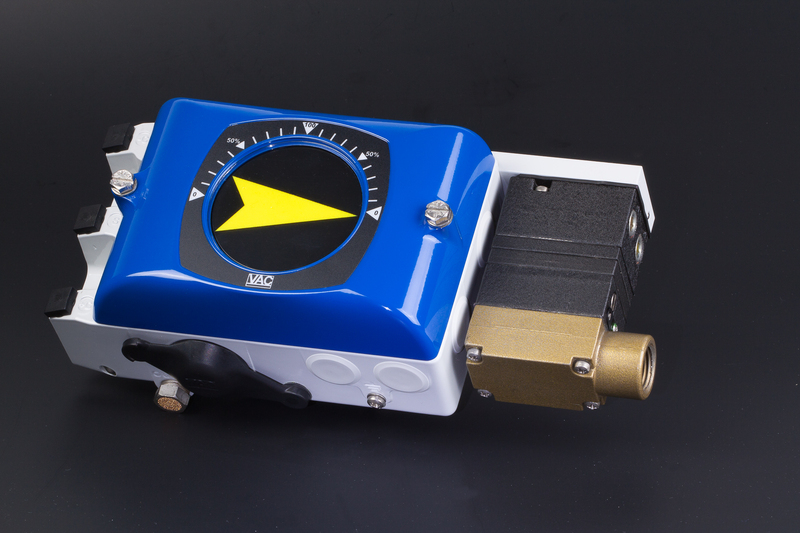 The pre-calibrated External IP is mounted directly to the V200P base positioner with a short adapter plate and uses the actual supply air pressure, filtered through a specially designed filter. The I/P converter then converts this pressure via an electrical signal to a 20-100kPa / 3-15psi signal back into the positioner signal diaphragm chamber for mechanical positioner response.